The United States government never supported the Allende government — in keeping with the Cold War containment policy, President Nixon approved millions of dollars to be spent in a failed attempt to prevent Allende’s election in 1970. The continued hostility of the U.S. towards the Allende government led to lingering suspicions about America’s possible involvement in the coup. Those suspicions were fed by the movie Missing by acclaimed director Costa-Gavras, based on the book by Thomas Hauser, about two Americans killed during the coup. 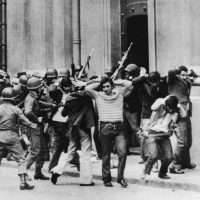 Americans were enraged that the State Department and the CIA had collaborated with the Chilean police force to orchestrate the murders of Frank Teruggi and Charles Horman, supposedly to keep secret how the United States actually orchestrated the coup in order to help Pinochet become the head of Chile. Samuel F. Hart was stationed in Santiago through it all, and in an interview with Stu Kennedy starting in 1998, he relates what he saw and discusses the truth behind Missing. It came on the 11th; it came a week early. It was bloody. Not that that many people were killed in the original coup attempt, but there were a lot of scores that got settled after that. A lot of innocent people died, as well as a lot of people who were in the wrong place at the wrong time. Q: Did you have any feel for what we were doing, or the CIA, or anything else? I was aware of most of what the CIA was doing. I was aware that the CIA was funneling money to the chief opposition newspaper, El Mercurio. I was aware that they were funneling money to some non-Communist labor unions, including the truckers’ union. And I was aware that they were funneling money to some radio and television stations, like those run by the Catholic Church…. And I thought that that was a legitimate activity for CIA. Nobody ever sat down and said, “This is what we’re doing,” but I had enough friends who were in the Agency and what have you, somehow it kind of leaked and seeped. It was never explicit; it was always just kind of figuring these things out. I had access to a lot of the Agency reporting, and I think, probably, over time, you could read between the lines and figure it out. The Agency did make much of their reporting available. The Agency station chief there was a guy by the name of Earl Warren, who was a first-class officer. He was a first-class officer. And the Agency, in contrast to the State Department, did something when Chile came along that showed that they’re a lot smarter than we are about personnel problems: they put their very best people into Chile. They scoured Latin America to find their very best people to put into Chile. The State Department didn’t do that; we just went with the normal personnel system. Stuff happened, and we didn’t say, “Look, this is a place we want to have the best in our family.” Interestingly enough, State Department people in Chile during this period and at the time of the coup, with only one exception, or, you might say, two, came out with their careers tarnished. Whereas the Agency people were all looked upon as heroes…. Some people were tarred with the brush of having participated in the murder of an American citizen. 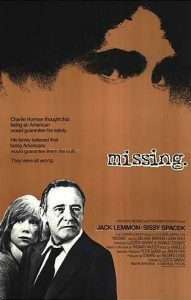 A total lie, but the movie Missing and the book Missing implicated Fred Purdy; the MILGROUP commander, Ray Davis; Judd Kessler, who was the acting AID [Agency for International Development] director; and Nat Davis as being responsible for the murders of Frank Teruggi and Charles Horman. Total garbage and crap and outrages were turned into instant history by the movie, and that’s what the American people believe happened in Chile. It’s not what happened in Chile. The debate that kept going on, in one way or another, in the embassy and in the U.S. government, over time, was: “What should we do about Allende?” And there were a lot of us who said, “Don’t do anything. What we do is not effective and it’s not necessary. This is a Chilean problem. Chile’s of no interest and value to us strategically or in security terms. Even if a Communist regime takes over here, so what? Henry was right — this is a dagger pointed at the heart of Antarctica”…. “Let’s just let nature take its course here. That’s the best policy.” It was that debate versus the activist debate. In the end, we came out kind of in between. But we were not responsible for what happened; the Chilean dynamics were responsible for what happened. But when history was being written, that’s not the way it came out. 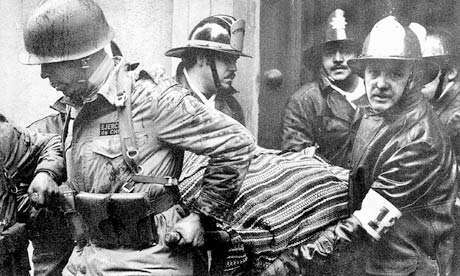 The U.S. became the key element, the crucial element, the catalyst in what happened in Chile. Chileans know that’s not true, but the rest of the world probably doesn’t. Everybody knew the coup was going to happen; it was only a question of when…. The way it unfolded was, the majority of the embassy staff started in to work on the morning of the 11th of September and got within eight or ten blocks of the embassy before they ran into the first roadblocks…. The embassy people made their way into the embassy building, which was almost on the square. It was just a tiny bit off the square that looked onto the Presidential Palace. When I parked my car down there that morning and walked around and saw that something really serious was going on, I still didn’t know exactly what it was. Although the coup machinery had started to turn about four or five o’clock in the morning, it wasn’t until right after we got in the embassy, 8:15, 8:30, something like that, that the military came on the radio stations, announced that a coup had occurred, announced that Allende had been removed from office, and called upon him and all of his ministers and all of his supporters to peacefully surrender. The military were in great evidence in the square in front of the Moneda [Palace, the President’s residence]. I couldn’t see the other side of the building, but I’m sure that they were there, too. And the people were filtering in. At that time, there was not much shooting. The shooting started around nine. The military kept broadcasting these calls upon Allende to surrender. He was in the Presidential Palace. He had gotten there from his home when there had been a bungled attempt to get him at his home. They had missed him, and he had fled down to the presidential palace. There were a few other people in there, too. Some of us, in order to get a better view of what was going on at the palace, went up on the rooftop of the embassy building. There was some shooting going on between the troops on the ground and people in the office buildings that were in downtown Santiago. But at that time, there was no shooting at the embassy; otherwise, I would have never been on the roof. Later on, after repeated calls for Allende to surrender had not been heeded, his supporters in office buildings around the embassy started firing on the embassy. And (cruelest cut of all) one of their main targets was back in the attaché section — they shot out all the air conditioners. [T]he Allende supporters had started getting arms as far back as 1971, ’72. Cuba shipped some arms in to the MIR [Revolutionary Left Movement party], and these were handed out to Allende supporters in the poorer sections of town. And they had brought arms into the government office buildings where they worked and what have you. So there was sniper fire going on between the office buildings and the ground. Inside the embassy, practically everybody was there. We were tuned to the radio. We had an open phone line to Washington. And we had gotten hold of a guy over in the Carrera Hotel who had a better look at what was going on in the palace than we had, particularly since we couldn’t go on the roof anymore because there was too much sniper fire, who had kind of a front-row perch there, looking at what was going on in the front of the Moneda. He was on the phone line telling us, and we were relaying to Washington. By ten or eleven o’clock in the morning, the fire against the Moneda — small arms and even some tank fire — started to get pretty heavy. 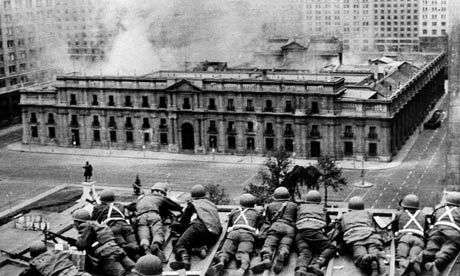 But that’s a big, heavy building, and there seemed to be no inclination on the part of the Allende people inside to surrender. He was warned that if he didn’t surrender, there’d be an air strike against the Moneda. 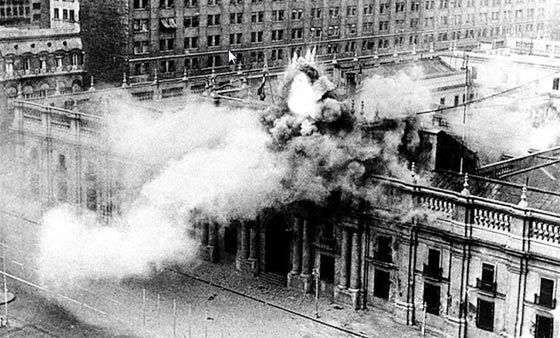 And, indeed, after a number of delays, right around noontime, three or four Chilean Air Force jets came in and fired rockets into the front of the Moneda. Into the front door of the Moneda, actually, which was a big, heavy, metal-reinforced wooden double door. Shortly after that, around one o’clock, the troops stormed the Palace. Allende’s Death: Suicide or Execution? This is where history may never give a final assessment of what happened. Allende was in his office. He was found dead, with a massive wound from an automatic weapon that had been given to him by Fidel Castro. There are two versions of what happened. One version is that he committed suicide, saying that he would never be taken alive, that he would not let himself be subjected to the humiliation of being a prisoner–an ousted president who had been brought down by the military. The other one is that the military got him and executed him with his own weapon. I was very close personal friends with Allende’s favorite nephew. He had no sons…. And his favorite nephew told me, shortly after the coup, that his uncle had told him that he knew the coup was coming, but that he would never be taken alive and forced into exile or put into prison or anything like that, that he would kill himself first. This nephew…said that he was convinced, having seen the body and having talked to his uncle beforehand, that his uncle had committed suicide. It really doesn’t make any difference. It really doesn’t make any difference. The fact is that he was killed as a result of the coup. Early in the morning, they said, “Everybody go home. Get off the streets. You have an hour to do so,” or something like that. That was like at ten o’clock in the morning. Well, there was a hell of a lot of shooting going on. The embassy people stayed put. Around four o’clock in the afternoon, there was a truce declared. People who were downtown were told to go home, that martial law was in effect, and that there would be a curfew until further notice. The embassy was divided up into duty teams, duty sections, if you want, the idea being that you would serve 24 hours on and 24 hours off, and people were designated to which team they’d be on. I happened to be on Team Two, not on Team One, so I loaded a whole bunch of people into my car, and at four or five o’clock that afternoon, we made our way home. There was still some shooting going on, but it was much reduced from what it had been…. The expectation was that we would show up the next morning (assuming that the curfew was off at eight or nine o’clock in the morning) and relieve the people who had stayed on overnight. Wrong. That’s not the way it worked out. The curfew stayed in effect 24 hours a day for about 48 hours. So the people who were in the embassy were stuck there…for 48 hours before their relief came. But afterwards, we did 24-hour shifts. A dusk-to-dawn curfew remained in effect for a long time. And some form of curfew remained in effect in Chile for years. For years. There was a lot of shooting; a lot of scores were settled. The amazing part to me was not that you had two Americans, Frank Teruggi and Charles Horman, who were killed during the coup, but that there weren’t more. Q: There was a movie called Missing, the basic claim of which was that a young, radical student, an American, came down and got messed up in politics and all, supporting Allende, and for some reason or other they decided he had to be killed, and he was killed, and that the embassy colluded in it because he interfered with our policies. I wonder if you could talk a bit about the period just before the coup, and the Americans who arrived there. It was a time of a lot of demonstrations. This was the thing to do in those days, for students. Did we have a problem down there, and how did we see it, if we did? The arrival of Salvador Allende into the presidency of Chile was like a magnet not only to certain groups from the left in the United States, but really from all over the world. In Western Europe it was true, too…. Allende, however, was essentially a bourgeois, gradualist kind of person. He was not a flaming revolutionary. Here was a guy who, in all of his tastes, in all of his life, had been anything but a flaming revolutionary. He loved wine, women, and song. Fast women and slow horses were his vices. Salvador Allende put together a coalition which included totally contradictory elements. And one element was essentially a Maoist-Fidelista-type of armed revolutionary. Those people were attracted, too, more of them from Europe and other Latin American countries than from the United States. 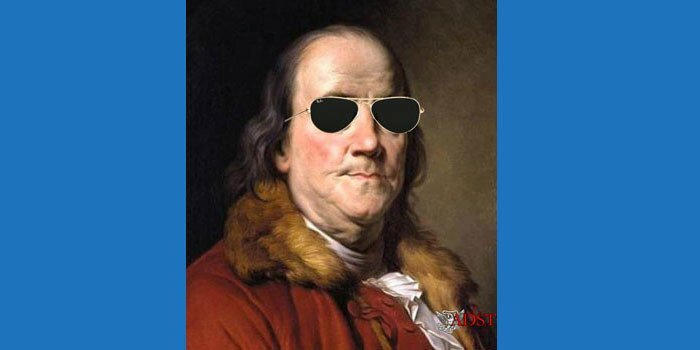 From the United States, what you got mainly were idealistic young people who wanted to be at least flies on the walls to a wonderful humanistic experience. There were maybe ten thousand of these people, all told, in Chile. And of those, maybe one or two thousand were Americans….Some of them did, you know, kind of social work in poor neighborhoods, and some of them just kind of drifted into the coffee house, revolutionary-song-singing, feel-good kind of activities; but strictly low level. Most of these people wanted absolutely nothing to do with the embassy; the embassy was the enemy. Some of them registered with the Consular Section. Many, many did not. Some came and left. I can’t remember the numbers exactly… but at the time of the coup, the total number of Americans in Chile, excluding official Americans, probably was two or three thousand. And of that number, those associated in some way or another with the Allende regime were two or three hundred. The embassy, at considerable personal risk to the people actually doing the work, who were mainly consular officers, was able to get all but two of these people out safely, notwithstanding the fact that some of them were engaged in activities which, had they been Chileans, would have gotten them killed…. 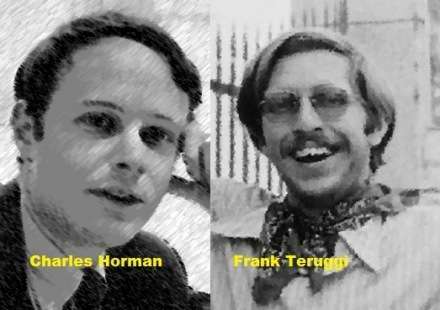 In the cases of Charles Horman and Frank Teruggi, the embassy was not even aware of their existence until after they were dead. They had parents, or relatives of some kind, who had requested information on them. I say the embassy was not aware of their existence, that’s not quite true. In the case of Charles Horman, Ray Davis, who was the MILGROUP commander, gave Charles Horman a ride back from Viña del Mar about a day or two after the coup. So he knew that Charles Horman existed, and he knew that Charles Horman’s wife existed. So he did know they existed, but the Consular people didn’t know this, as far as I’m aware. But Frank Teruggi was not even on the radar scope. What probably happened, in the Teruggi and Horman cases, as far as anyone is able to tell (and the only people who really know what happened are the Chilean military or police involved, and they ain’t talking), was that Horman and Teruggi were caught up in one of these sweeps that were being made against all kinds of Allende supporters in the days and weeks following the coup, and they got unlucky. Either they mouthed off to some sergeant or lieutenant or captain, some low-level official, or something happened, and they were killed, probably both of them within a week of the coup. Then, as we tried and tried and tried to find out something about them, the Chileans covered it up. It took quite a long time before the bodies were even located, and when the bodies were located, there was still resistance about having autopsies performed and all of these other things. The thesis of Missing is that Teruggi and Horman knew things about U.S. participation in and planning and perhaps masterminding of the coup which the U.S. government did not want made public, and so they were killed in order to keep their mouths shut. That is total claptrap…. Horman knew nothing, Teruggi knew nothing, because there was nothing to know, in the sense of saying that the U.S. government was the intellectual author of the coup. Ain’t so. It just ain’t so. 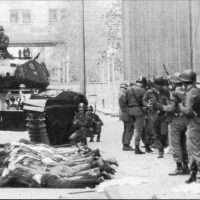 The Chilean military were the intellectual authors of the coup, and the coup would have occurred even if the United States of America didn’t exist, for purely Chilean reasons, because the military thought that Allende (a) had violated the constitution, (b) was trying to hand the government over to a group of armed radicals (which was a violation of the constitution), and (c) had put the country in a position where a civil war was about to break out. They considered themselves the ultimate arbiter of the Chilean state, the Chilean body politic, and they stepped in. Unfortunately, the guy who was the head of it was Augusto Pinochet, who is as mulish and as unbending and as unfeeling… He’s not a nice guy, and he’s not the guy who should have headed that coup. But that was the way history worked out… and we were stuck with him.